1918 Picture postcard franked 2pcs. 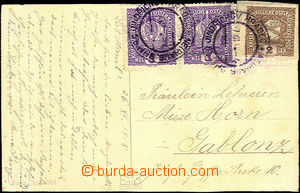 3h Austrian Crown + 2band 2h Merkur (the second stamp on the picture side), cancelled Jindrichuv Hradec 27.XII.18. 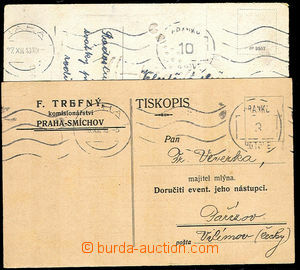 1918 2 entires (printed matter and picture post card) with machine postmark PRAHA 1 FRANKO HOTOVE/ 20.XII.18 and 27.XII.18, light postmark imprint. 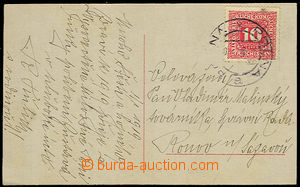 1918 money order sent from Poland to Moravia franked with 15h + 5h Small numbers, Mi.47, 61, cnl. Štitina Rak. Slez. 3.XII.18, seldomly seen.! Pof.3, 5h light green, complete 100-stamps sheet, plate 1, superb unfolded! Pof.3, 5h light green, complete 100-stamps sheet with margin and control-numbers, plate 2, superb unfolded! 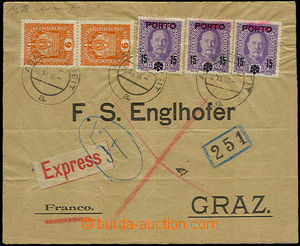 Pof.5, 10h red, complete 100-stamps sheet with margin and control-numbers, plate 1, superb unfolded!